BENGALURU: Ozone FC and Hindustan FC played out a 2-2 draw in their second Hero 2nd Division League final round fixture on Sunday (May 27, 2018). Ozone FC took an early lead through Sabeeth Sathyan (3′) only for Kushant Chauhan (5′) to equalize for Hindustan FC before Ashutosh Thapliyal (57′) put the Delhi-based side ahead, however Robert De Souza’s (82′) late goal helped Ozone FC to escape with a 2-2 draw from a dramatic match at the FSV Arena in Bengaluru. While the draw knocked Ozone FC out of the competition, it put Hindustan FC on top of the table provisionally with 4 points. The match got off to a flying start with Ozone FC quickly on the front-foot and it took them only three minutes to break down Hindustan FC’s resistance when Sabeeth Sathyan opened the scoring with a well-taken shot inside the box following a neat back-heel from Yongchan Son. However, Ozone FC’s joy was short lived as Hindustan FC surged forward with much precision and equalized via Kushant Chauhan’s blistering shot after a long ball from Pawan Kumar Joshi two minutes later. Two goals within first 10 minutes on either side of the pitch opened up the game as both sides were searching for a crucial blow. Nikhil Gehlot and Kushant Chauhan combined well on the left-flank for Hindustan FC while Sabeeth Sathyan was a constant threat with his darting runs in Hindustan FC’s final third. 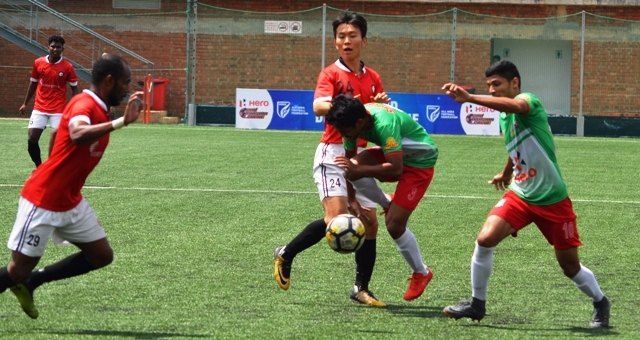 Nonetheless, Ozone FC grew in confidence as the game progressed with both Sabeeth Sathyan and Robert De Souza forcing a number of good saves from Hindustan FC goalkeeper Mithun Samonto. Despite enjoying a lot of possession in the later stages of the first-half, Ozone attackers failed to click as a unit and the supply from their midfield was often wasted. The scoreline remained one-goal-a-piece going into the breather. In the second-half, Hindustan FC ran circles around their opponents, and in the 51st minute, Ozone FC keeper Amit Kumar blocked a close-range shot by Kushant Chauhan to concede a corner before denying Shailesh Maurya three minutes later. Hindustan FC’s efforts were finally rewarded after substitute Ashutosh Thapliyal turned Chinta Chandrashekar upside down before unleashing a right-footed bullet in the 57th minute. The Delhi-based side almost got their third goal in the 76th minute when Shailesh Maurya and Nikhil Gehlot combined on the left flank. A quick one-two sent the former clear and the lanky winger cut past two defenders only for his powerful drive to go inches over the horizontal. Afterwards, both sides engaged in some end-to-end stuff. While Hindustan FC had the better chances to go further up but what followed was schoolboy errors and impatience in front of goal. Ozone FC, on the other hand, capitalized on a defensive error as Robert De Souza scored with eight minutes left on the clock to make it 2-2. The two teams then launched attacks in search of a late winning goal, but they could not score and the match ended in a stalemate. Ozone FC will face TRAU FC next on Wednesday (May 30, 2018) while Hindustan FC will square off against Real Kashmir later in the same day in a match what might turn out to be the title decider.